The market managed to close under the TA again and I almost changed the signal to the bearish side but I have the trend slightly sloping up. 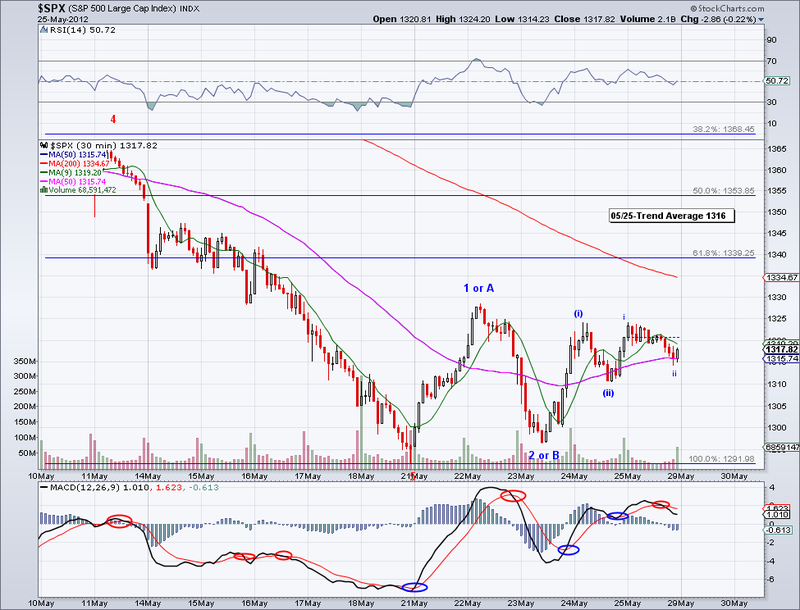 So we need another close under the TA or an impulsive wave either way to dictate direction. I see 5 waves that ended at the 1298 low today and despite the sell off, we have been getting higher lows and higher highs (the 1335 level reached on Monday turned the weekly trend to the upside). 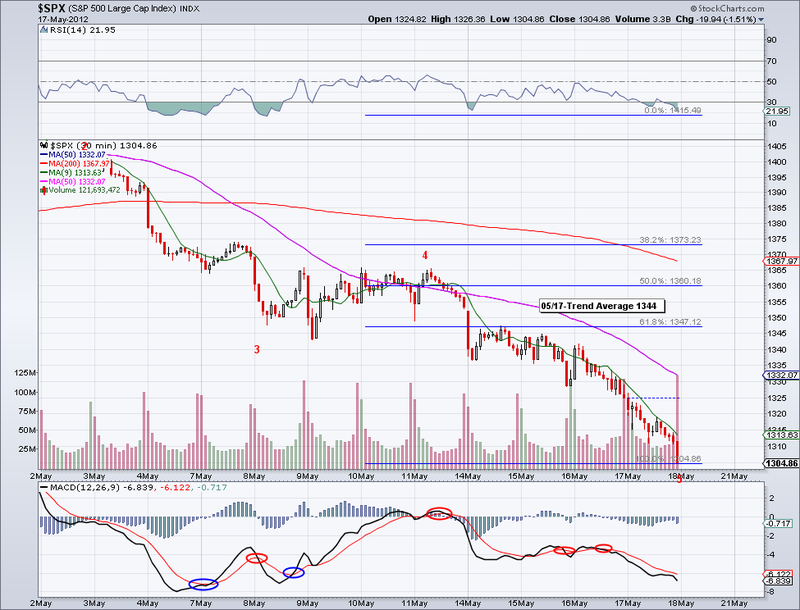 So if the market can not make lower lows, it has a good chance of taking out 1335. 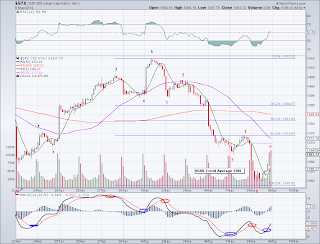 When the A wave started, I posted that it could be an A or a W1 and that we could see a sideways correction. So we have now gotten that correction and the market is getting ready for an impulse to either finish a bearish 5th wave to test the 200 day MA or an bullish W1 to 1364+. The market reversed all of yesterday's gain and some more today and in turn invalidating the possible intermediate 5 wave count. So I am now labeling the waves from 1292 as an ABC, the C wave in particular is a messy one given the fact that we had a holiday weekend and prices from pre-market are not reflected on the cash market. 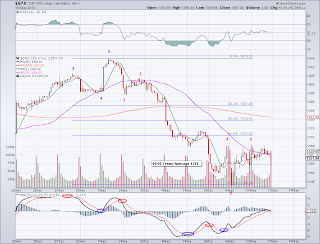 Assuming the C wave topped at 1335, I see a bearish 5 wave count which could have finished today or possibly tomorrow. Also, the market closed couple of points under the TA and in order for the trend to remain bullish the market can not close underneath it again tomorrow. 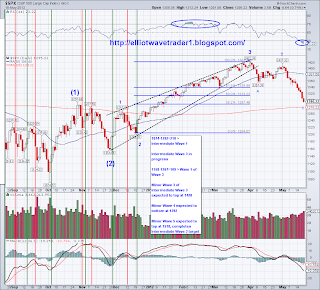 The once the trend is solidified (to the upside or downside), we will see a 45-50 point move. From the technical perspective, odds favor a much bigger rally that what we've seen so far and not really further downside. But obviously, oversold can get more oversold so we'll just have to wait and see. 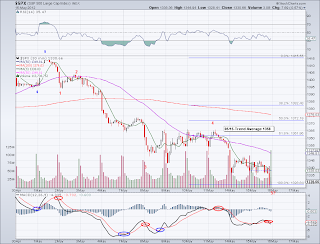 The market gapped up as I had been predicting and in turn this has turn the TA to the bullish side. 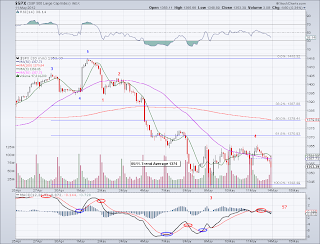 So today the signal changes and now the TA serves well as a good point to place stops. What remains to be see in whether this is a C wave or a W3 wave and I am hoping we will get the answer in the next week or so. Also, it's worth pointing out the daily MACD is also giving a bullish confirmation so whether the 1292 level is the actual low or not (in case the market goes for the 200 day MA), I feel good with the longs I've been adding. I suppose if China announces a stimulus it will be a great excuse to propel the markets. And while EU continues to be a concern, this is exactly the same song a dance they put up last year.. in the end people will conveniently forget IMO until we need a catalyst for another correction. Double Nested W 1-2 ? The market didn't do much on Friday but it didn't make a lower low either and in turn it left another W1-2 nest within a W1-2 nest for double nested bullish count. 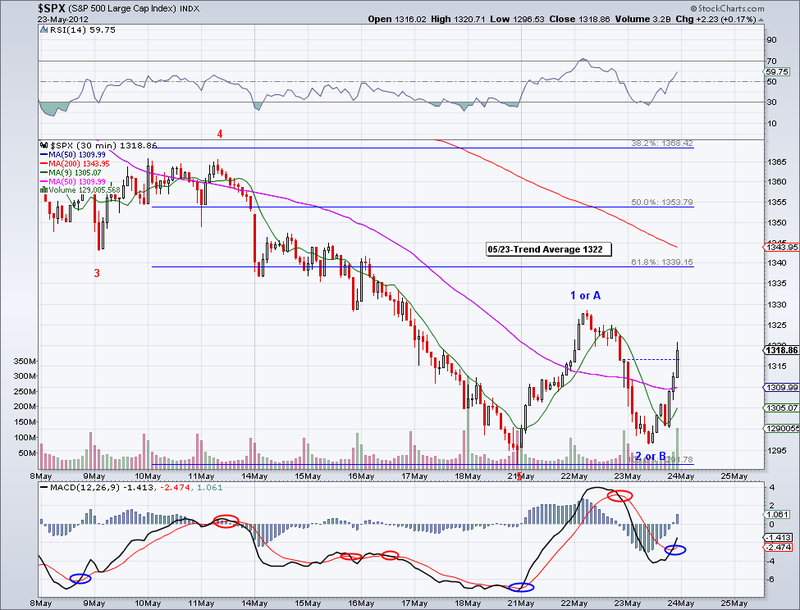 If this count is correct, we should gap up Tuesday morning significantly or rally hard from the start of the day. The market actually closed over the TA again for the second day in a row but since the TA is sloping down, we can't confirm a change of trend until it starts turning up. 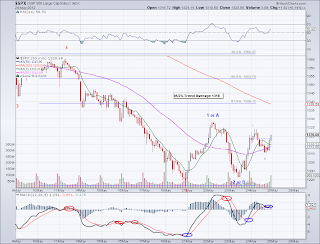 Another close above the TA, especially in a strong bullish day would change the trend to the positive side. Hope everyone is having a good Memorial Day Weekend! The market finally closed over the Trend Average (1318) today, its first close over the TA in more than 3 weeks! 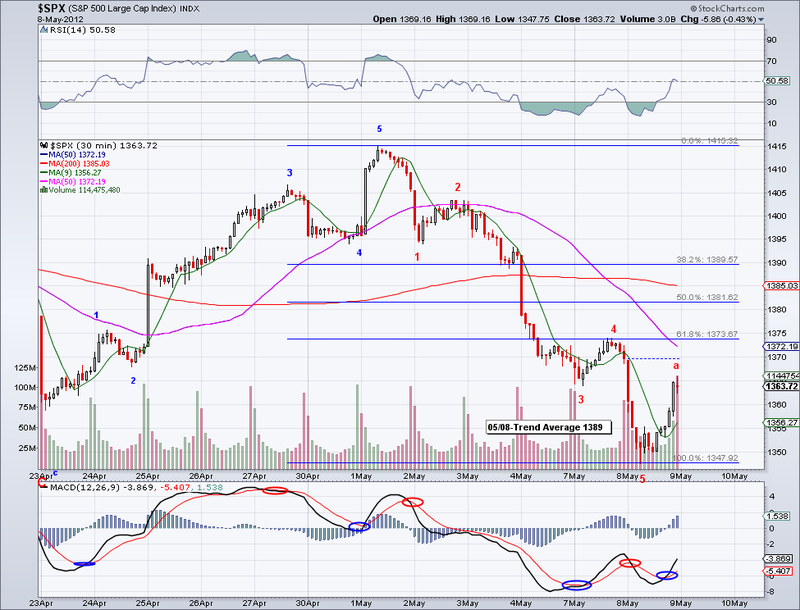 And the market left a bullish nested W1-2 set up so we just might see a gap up tomorrow. The news continue to be on the bearish side and if this leg turns out to be the W1 of minor 5, you'll see news change to the positive all of a sudden. It's interesting to see the changes in the market along with the news and how the news can be used as a contrarian trading tool. 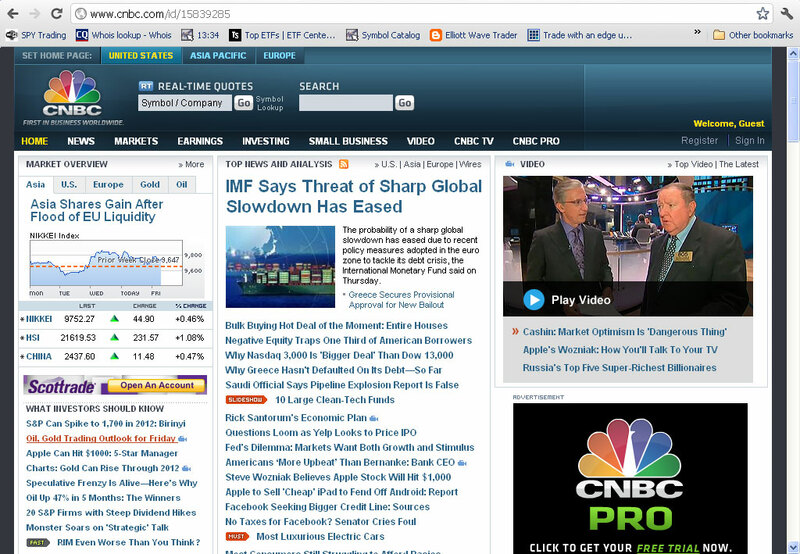 This is a screen grab around the top of the market this year, notice how 1700 is being predicted in one of the links. 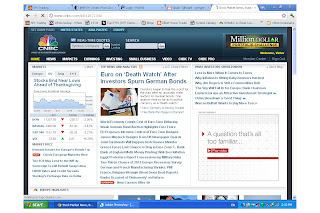 Now note the new at the bottom of the market back in November 2011. 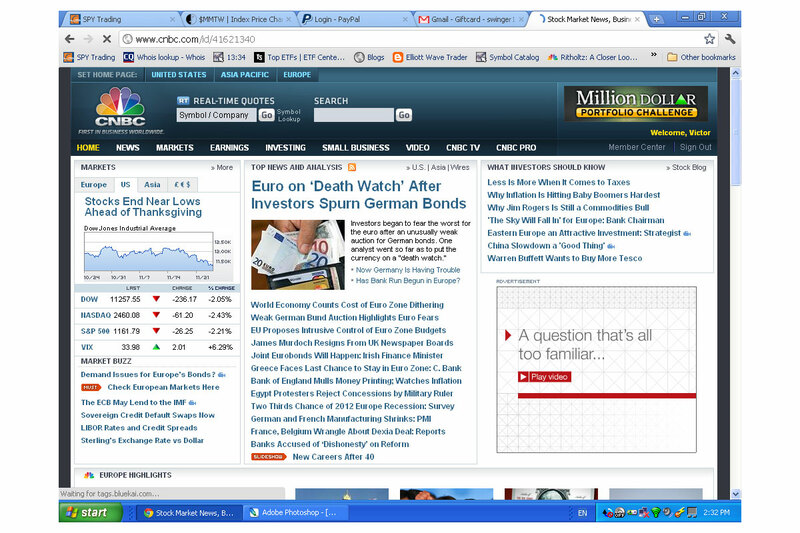 One would think the Europe would fall off the cliff.. yet the market rallied from 25% from there. 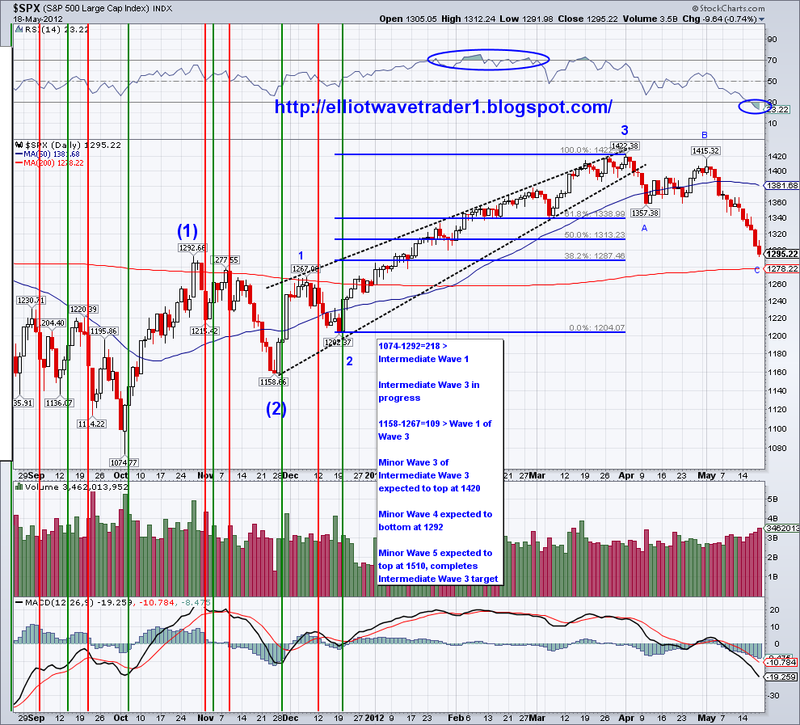 The market finished putting the W2 or B wave today and how the next wave turns out should give us a clue as to what to expect the remainder of the month. If this is a 5 wave move, we should see 1364 at the low end but if we get a decent 1.618 wave we might see the 50 day MA tested before a meaningful correction. 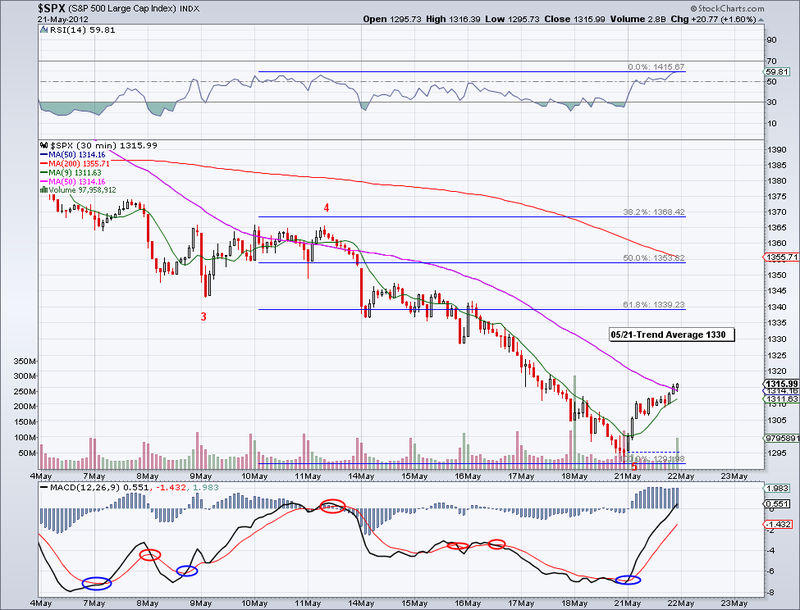 But first we need to see if the market can re-take the trend average and rally 30-40 points from it on the W3 first. 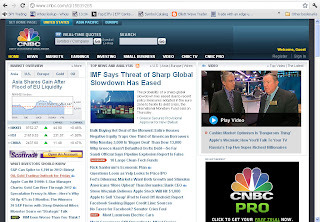 Perhaps the "good" news from Europe will continue to propel the markets tomorrow. The trend average was finally tested today and it seems like Wave 1 or A topped today at 1328 which is approximately 36 points from the 1292 bottom. 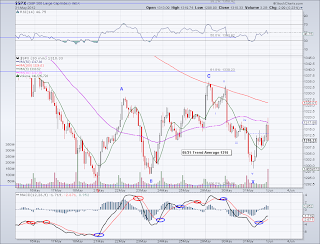 And now we will see if we're in for a 5 wave move fairly soon. 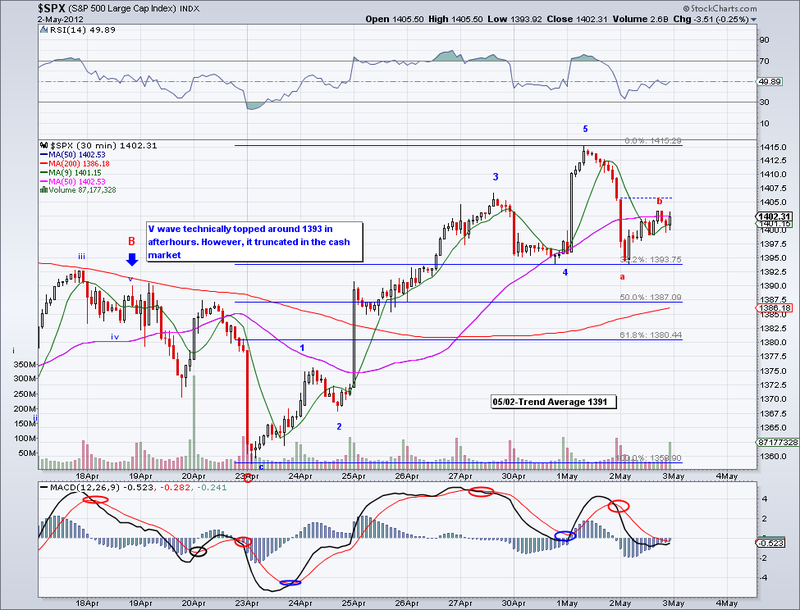 If this is a 5 wave move, we will see 1364 at a minimum when it is done. But if this ends up being an ABC move then the target level will be lower and we will see another strong bearish wave to test the 1292 low again. Seasonality doesn't really help the bullish case but then again markets have minds of their own, so we'll just have to wait and see how the first couple of legs evolve. And how about them Facebook stocks? seems like it was a sucker's IPO, down 20% in couple of days. FB reminds me a lot of Yahoo (a former client of mine back in my Silicon Valley days) and America Online. At the height of the internet craze, these two stocks were gold but after failing to monetize traffic their valuations came down drastically. In AOL's case, they entered in possibly the worst larger merger in history and now they're barely around. And Yahoo is a mess waiting for someone to buy them out. So it will be interesting to see where FB will be in 10 years, for one I think they are better than my space (sold to Murdoch for $500 million in mid 2000's, then re-sold for $30 million recently). But they're not exactly google or amazon, so my guess is FB will probably end up where Yahoo is today eventually.. so a good potential short in the long run. 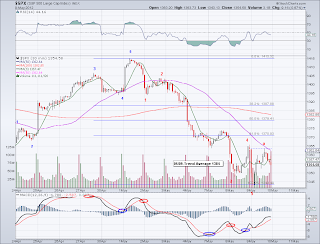 The market rallied as I predicted last week and what we saw today should be the W1 of whatever wave is coming. Keep in mind that a rally to 1510+ can happen at this time, however the market could be putting in a complex correction and in that case the market would trade in a range for few weeks or even months before breaking out to the 1510 target. So while it is ideal to think of this new rally as the beginning of the 5th minor leg, it is still too premature to assume so. Also, I wanted to address the overlapping of the W4 to W1 intermediary waves. Going by orthodox wave theory (which I don't really practice), the market bottoming at a fraction before 1292 invalidates the 5 wave count. However, the stock market is made of a multitude of stocks which include leaders and laggards. 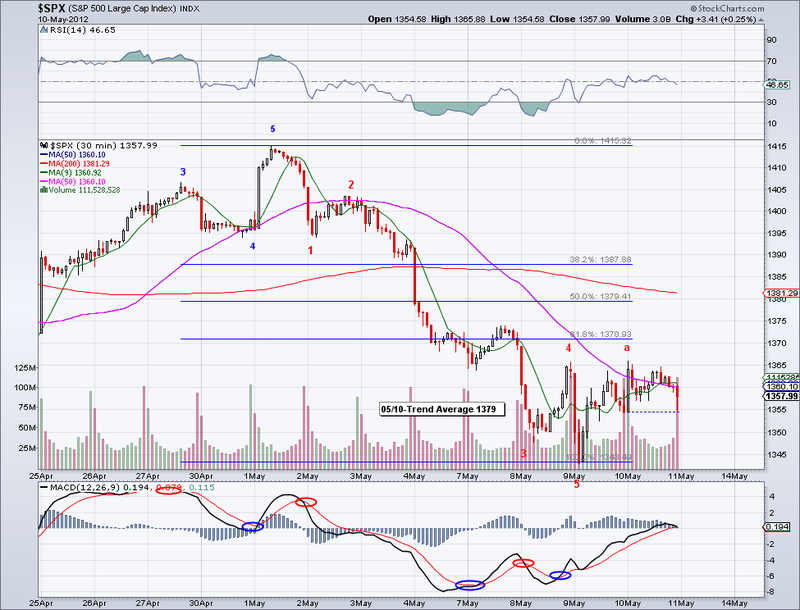 So while the SPX gets invalidated, you still have the Nasdaq and the Industrials which have not. 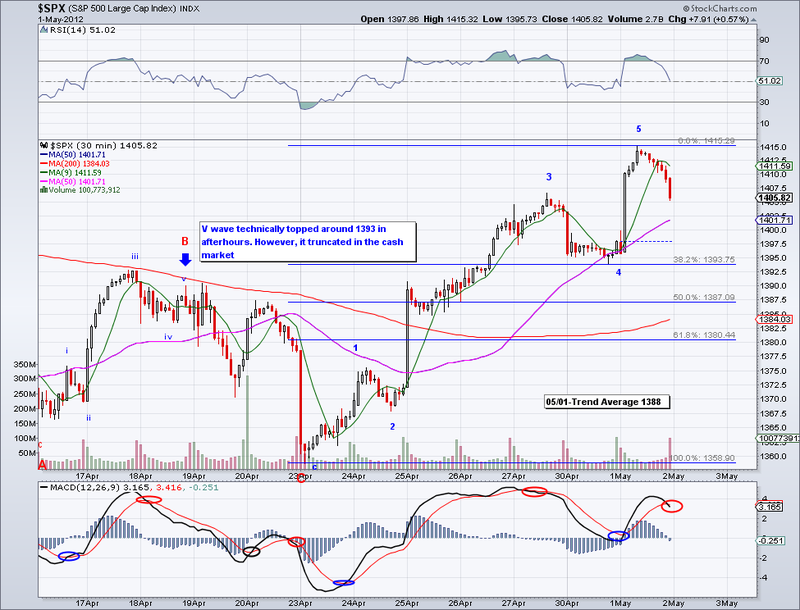 So for me to trash the count, I would have to see either W4 minor going into W1 minor or invalidation of all 3 indexes. 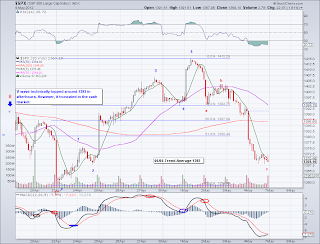 Furthermore, I have seen several times how technically invalidated waves still see a 5 wave impulse structures. So using wave theory as a guide is great but I am flexible with its use. Where I am not flexible at all is with the moving average and the trend average. As of today the TA is at 1330, 62 points less than when the signal was given.. the trade is with the trend, waves serve as a general evolving road map only. The target for W4 that I originally posted a few months ago (when it was considered completely outlandish by some) was finally put in today. 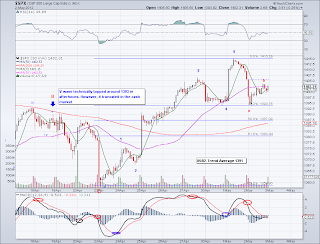 I added the ABC move to the long term chart but I have not changed anything else, so note the targets for the waves have been in place for quite some time. While some people might think the sky is falling, this was expected.. since 2-3 months ago! And just like it sounded outlandish to predict a strong rally in December and a 1292-1297 correction target in March, I now favor a rally to 1510+ to complete the 5 wave structure on the chart. 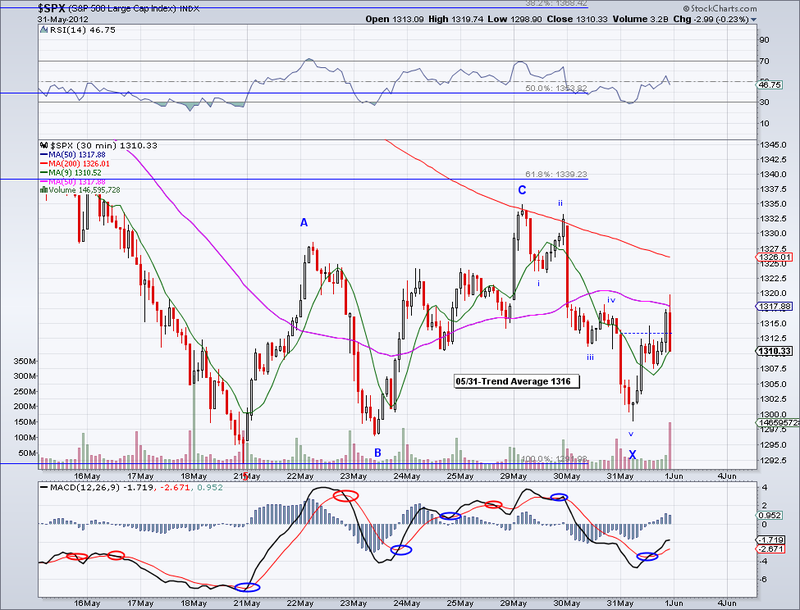 I consider the move from the 1422 an ABC move until proven otherwise. That "otherwise" would be W4 going into W1 territory which is 1267, so that is the line in the sand. As it stands, the market has not been this oversold since last summer (and 200+ points ago) by almost any TA standard. I track a few TA tools, the most simple one being the RSI on the daily and I circled it on the chart so you can see the obvious. So I expect the beginning of a rally next week. And again should the market continue to fall, then I'll trash the long term count I've had since last year (and note I don't bother with alternative counts). But for now, I am loaded on the long side and expect some sort of news or change of sentiment that will spark a rally at any moment. The market not only got to one of the levels I was hoping to see (1310) but it managed to get close to the 1297 level I first posted a few months ago. And now that we are so close, I am betting we will start to see a rally in the next couple of sessions. I originally leaned towards a 5 wave move to 1292-1297 with this wave being just W1 but in itself this wave already is a 5 wave structure and it looks pretty good as a C wave on the daily. So I am thinking the next rally is not going to be just a counter rally but the beginning of the W5 Minor with 1510 as the target. Where this wave will bottom is still up in the air but I'd say the 200 day ma is solid support along with the 61.8% retracement at 1285. But whatever it is, we are pretty close and the trade is on the long side IMO. I initiated longs today and will re-evaluate the position when we finally get back to the TA. Tomorrow might be the start of the rally since we got the Facebook IPO.. which reminds me a lot of Yahoo and AOL back in the days (especially since I see FB as a nicer version of myspace). The market continues to struggle in finding a bottom but like I said yesterday, the market should be pretty close to it by now. 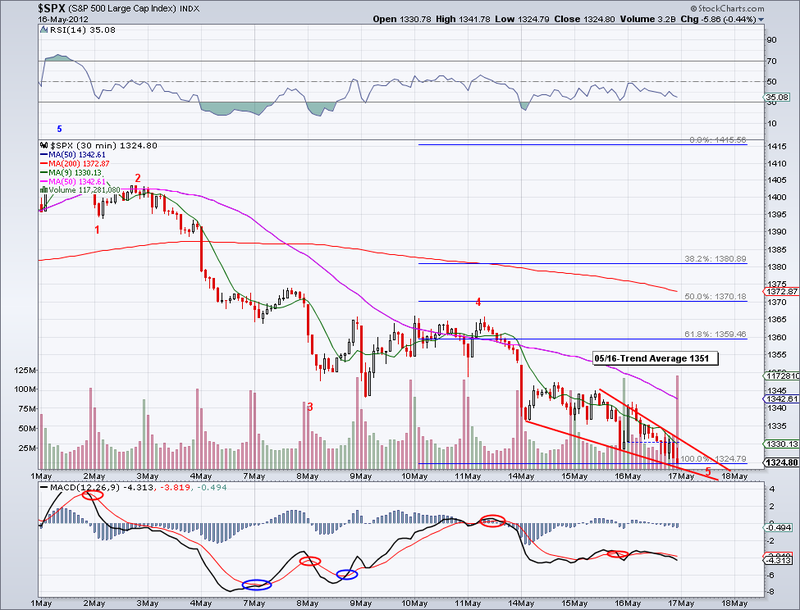 The levels I like are 1321 and 1310, the latter being ideal. But who knows, maybe the market is going for 1297 or the 200 day ma level without any significant bounce. A sharp down opening tomorrow would be ideal to go long IMO, might be a little early but I think it's safe to say it will be a winning trade. I'll keep my fingers crossed and hope we see 1310 in the morning.. The market made another lower low today and in an ideal world we could get one last capitulation sell off so buyers can jump in. 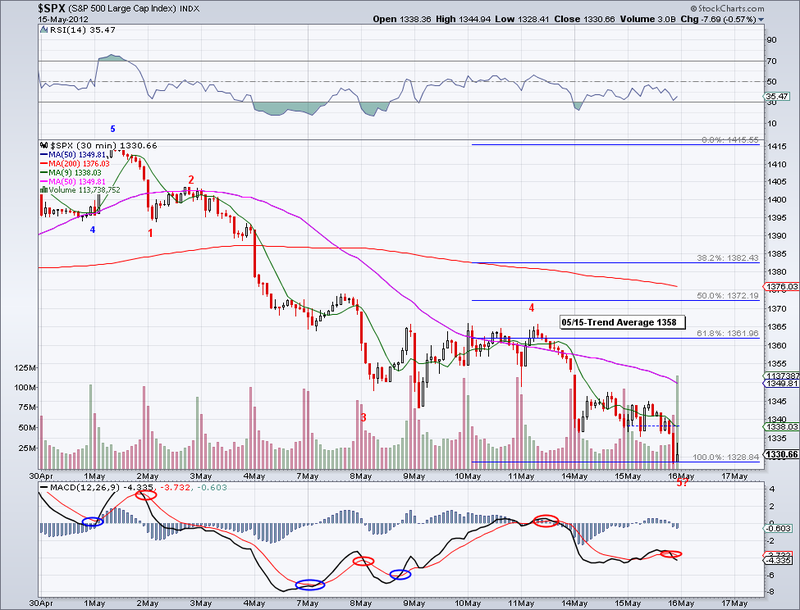 But as it is the market is oversold and very ready to start rallying to the Trend Average. Hard to tell if the selling is done yet but ideal levels for this wave to end would be 1321 or 1310, we'll just have to wait and see if the bulls are brave enough to jump in. If we get another low, I'll probably deploy some cash to work on the long side but I would only be playing the rebound as it seems like we will see further downside after the counter rally at this point. And in the overall picture, remember this is just a normal expected correction within a bull market. 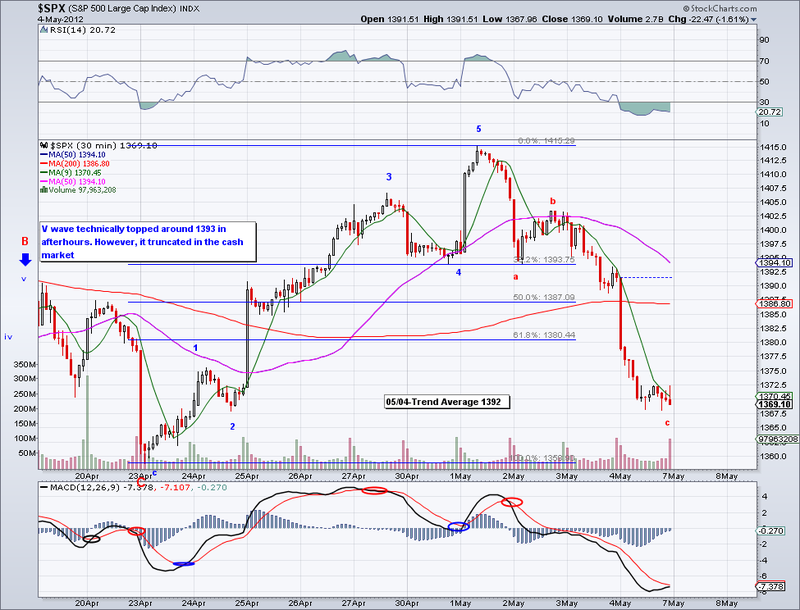 The market not only tested 1343 as I had been speculating last week, it managed to close below it. And now that this new lower low is in, the odds favor a stronger counter rally. The last few times the market tried to bounce it failed miserably but now that we have corrected to the Fib retracement area of the wave that started at 1202 in December, I favor a W2 starting in the next couple of sessions. The low today came in exactly at the 38.2% of the rally from 1202 but I'd be surprised if the market does not make lower lows after the bounce. I continue to favor a test of the 200 day MA eventually so we'll see how low it takes to get there. 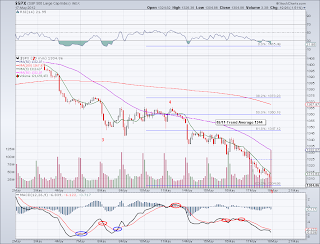 1343 Low to be tested early next week? Seems like all the choppiness in the last few sessions fit into a W4 after all, so it looks like the 1343 level will be tested (if not broken) early next week. The trend avg continues to descend and at this rate it will be in the 1360's by the time the market decides to start a real counter rally. 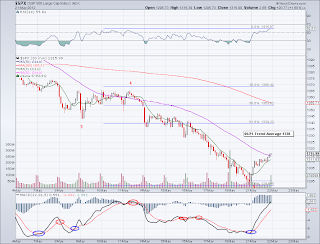 Perhaps the Facebook IPO will be a good excuse to spark the bounce, we shall see. The market seems to have a hard time bouncing and I think we should start seeing the B wave tomorrow before get get another counter rally to the Fib retracement area. Interesting how the mood in the market changed in just one week, last week I was expecting the bullish waves to continue and what started as a correction ended up being a sell off. But that's why the Trend Avg exists, to keep us aware of where the market is likely to go. As of today the TA is 1379 and dropping and while the market is taking its time to rebound, we will see a counter rally to test the TA sooner or later. 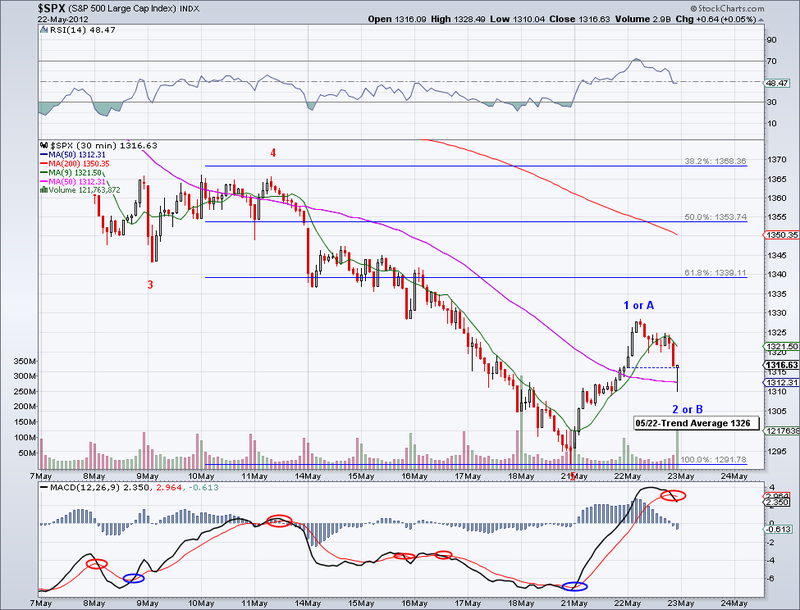 If the 1343 low holds then there is a good chance we'll bounce to the Fib retracement territory. At this point a test of the 50 day MA is looking unlikely but if we get there, that'd be a good spot get short/sell longs. Also, while sentiment has turned bearish, keep in mind the market rallied for several months without any significant corrections. So in the bigger picture, the market is just taking a breather before going to new highs. The intermediate trend has now turned bearish and it seems like we will see further downside after the rebound. I had to change labels on the count a little to better reflect the lower low today but we should see the market start a counter rally from here. 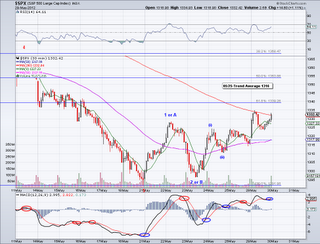 And like I said yesterday, the ideal place for the W2 to top would be around the 50 day MA currently at 1386. Also, I wanted to make clear where the 200 day MA is at the moment as this is a level many traders will be watching. 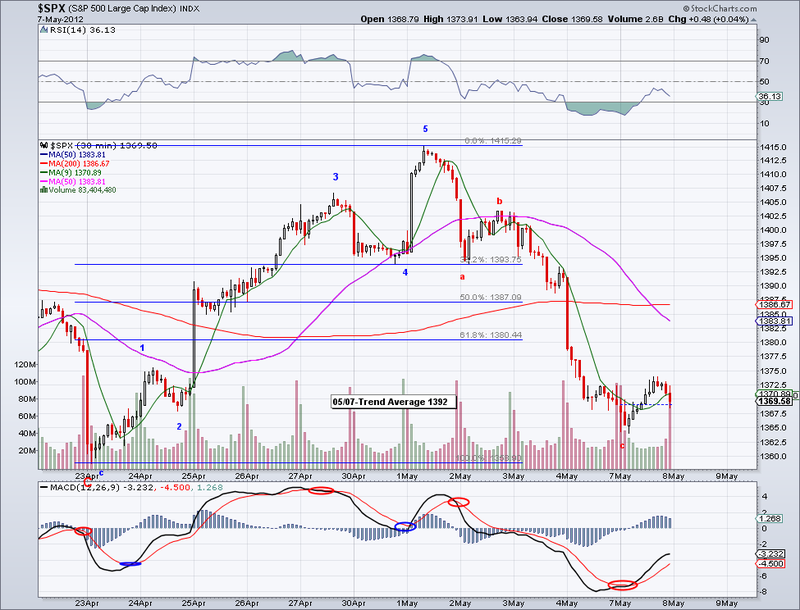 The level is 1276 and rising so maybe by the time the market gets there it will be around 1280-1290's. Looks like the market is repeating itself again and setting itself up for a bearish May, just like it did last year. I hesitated to change the labels from ABC to a 5 count until the 1157 low was taken out and with today's action we see a clear 5 waves down. So unless there is some sort of bullish miracle, the market will probably just make it to the 50 day MA or the TA and really sell off from there. Currently the Trend Avg is at 1389 and the 50 day MA at 1386, so that will be a good place to sell longs (if you were fortunate to buy late last week or today) and get short or stay in cash. And again if this rebound wave tops around that level, we should see 1300 at a minimum and perhaps bottom at the 200 day MA or the 1297 level I had posted previously a few weeks ago. The markets dropped hard in pre-market last night but at the time of the opening prices did not reflect the actual damage. So we have a pre-market vs cash dilemma again, pre-market confirms a bearish W3 and with more likely more downside ahead. But the cash market still shows a 90%+ retracement on an impulse wave, so it is unclear what will happen next just using wave counts. However, the fact the market failed at rallying today manages to turn the short term trend average bearish again so now the ball is on the bulls court to overcome the trend if we are to see a consistent rally above 1400. Whatever happens, I expect a test of the TA so I will decide then what to do with my long position taken on Friday and the VIX hedge. 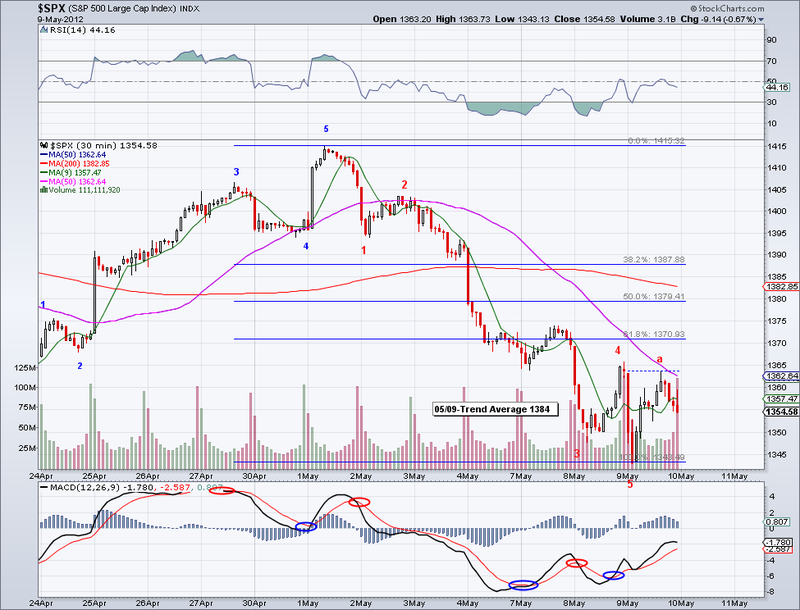 I get the feeling that if the market gets stopped at the 1387-1392 level we will see 1300 before 1400. For one we would have a nice Head and Shoulders again targeting 1300 more or less (assuming the low is already in for this wave). I've been procrastinating on updating my portfolio but I'll do it tonight or tomorrow. I have SDS, VXX, and FXI trades that happened last week that I have not added. 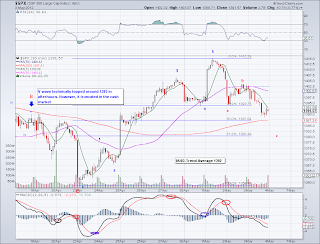 The market sold off today as I was hoping and it reached the target range I had and some more. It is a deep retrace so far and I am inclined to think of this as a W2 and we should have clarity early next week. If this is a W2 then we will see a huge rally next week that will break through the Trend Avg and then put in a new high. But if it fails to overcome the trend then it will turn the trend down and open up the possibility of a bigger correction. 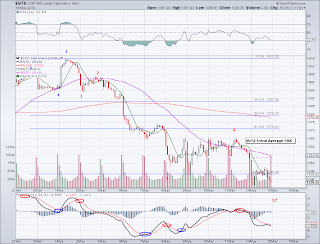 The leg I have marked as "C" is about 1.618 of "A" which if an ABC count then would open up for a rally on Monday. If we get a W4 and then further downside on a W5 then it will change the trend for sure and perhaps be the start of a W1 to the downside. 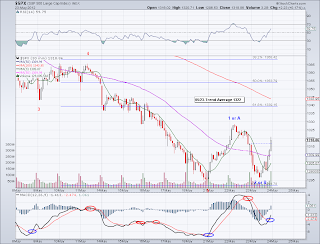 Whatever the case, the trend will be a good indication of where to be positioned. I opened up a long position today counting on at least a rebound to the TA, so we'll see what we get early next week..
We saw more downside today as I had been predicting and the market closed 1 point belore the Trend Avg. 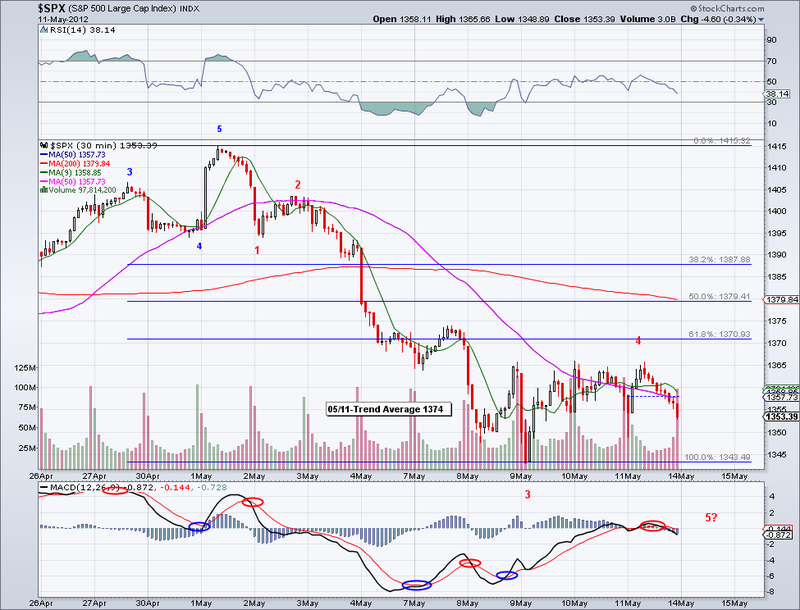 However, the ideal would be for this wave to bottom in the 1371-1380 range and see a bullish reversal. 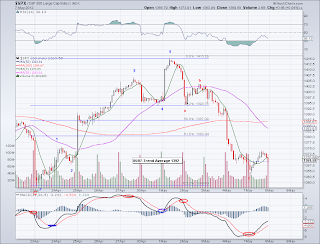 If this scenario materializes, we should see a strong bullish wave to take out the 1422 high. For now I am holding on going long until tomorrow, I will either go long if the target area is reached or if we start trading above the TA again. The market continued its correction that started yesterday and we now have what seems to be like a completed A wave and working on the B. 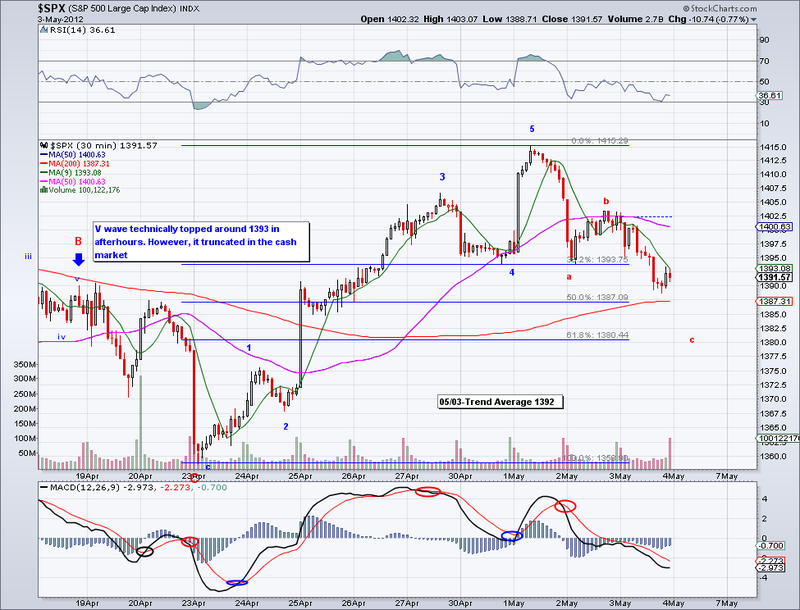 There is a head and shoulders that targets 1371. 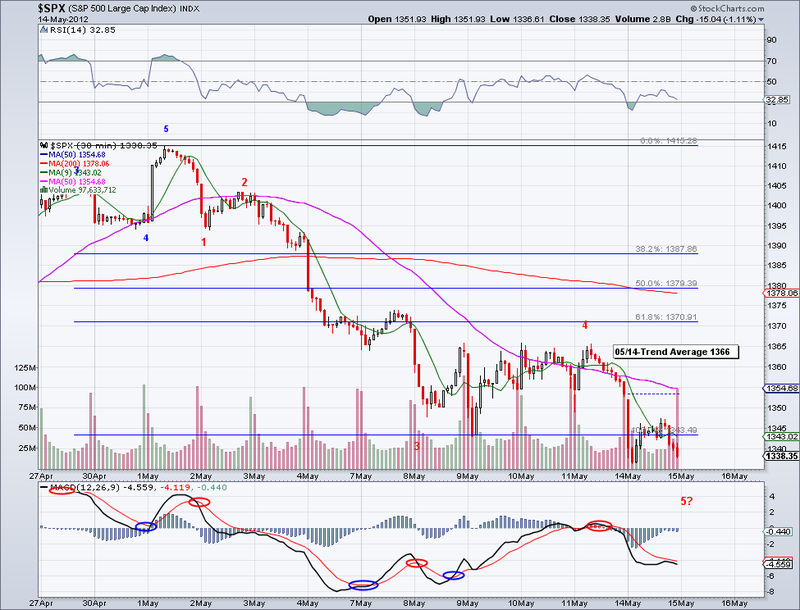 Also, if we assume B topped today and C is 1XA then we get 1380. 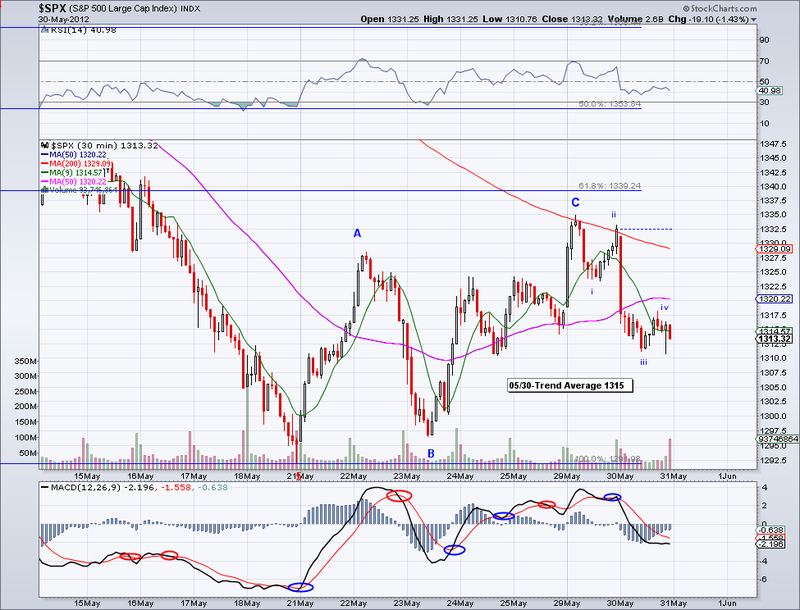 So there seems to be some more downside ahead that will ideally bottom in the 1371-1380 area. What is not clear not me at this point is whether this is a W2 correction or a W4. 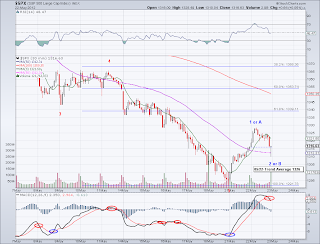 The deeper the retrace, the higher the chance this is a W2. 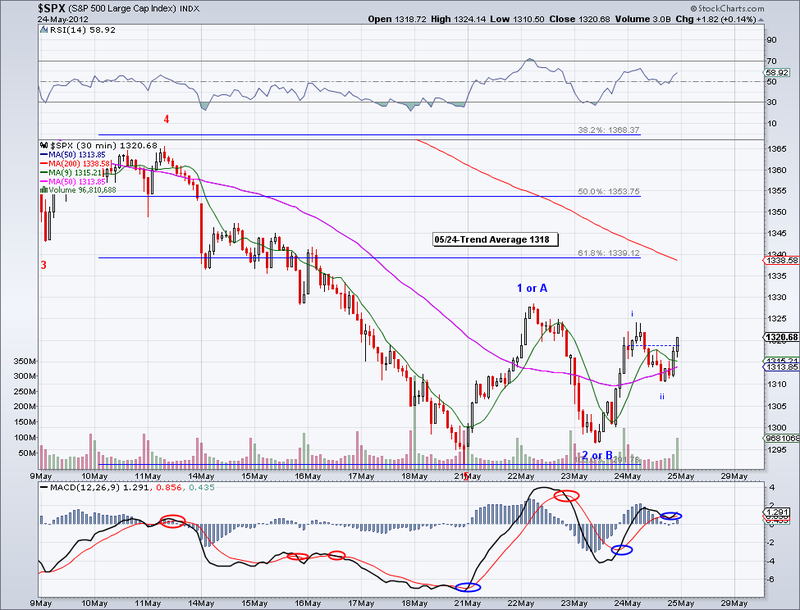 So for now I am looking to see how the Trend Avg holds, the current avg is 1391 and rising. 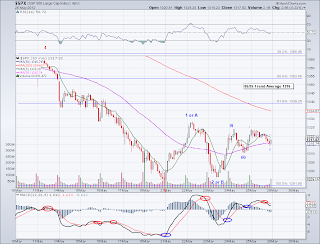 If the the market manages to test the TA successfully, we should see 1422 taken out on the next bullish wave. 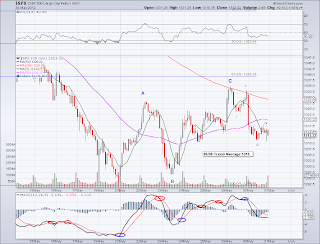 No trades today as I am waiting for this bearish wave to finish. I posted about a new high in May for the markets yesterday and today the DOW made that new high. And it is very likely the S&P500 and the NASDAQ will do so as well in the near future. 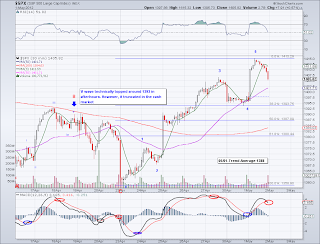 In a way I think it would have been better for the bullish case if we would have had a proper ABC correction to the TA but as it is, the wave is pretty strong and it seems like it is the beginning of a bullish summer. I closed my SDS position yesterday which I forgot to post and today I traded VXX intraday. But since it's time for me to go to sleep, I'll update the portfolio tomorrow. I am currently not long, just hedged and looking to go long at the test of the Trend Average which currently stands at 1388.